The river Vardar cuts through Skopje; most of the modern city lies to the south, while to the north is the Old City, which still shows the influence of many centuries of Ottoman rule in its architecture. In the oldest part, you walk through a web of narrow, crooked streets; it’s very much an evolved rather than a planned layout. Some of the cobbled lanes go up and down flights of steps. Cafes and bars spill outdoors; in the fine weather, everyone gathers outside to eat, drink, and socialize. None of the shops, with flats over them, are very large, and some are lower than modern street level. 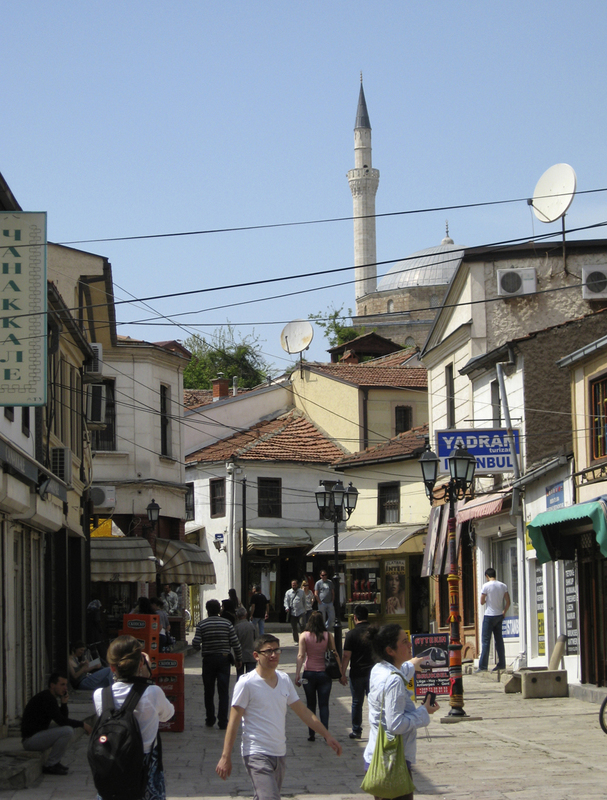 A typical street in the Old City section of Skopje. It’s very much how I imagine the neighbourhoods of Marakand, the city where the eastern and western caravan roads meet in Blackdog, give or take the motorcycles. 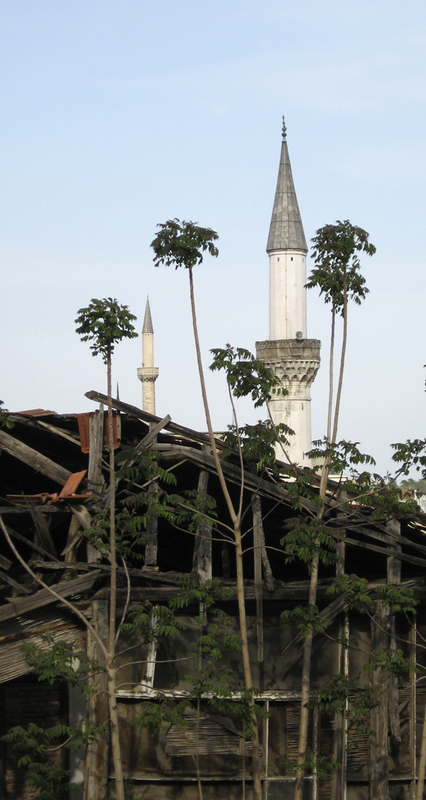 Like Marakand, Skopje has a history of earthquakes as well. The most recent bad one was in 1963, which destroyed much of the city and resulted in a lot of Eastern Bloc concrete going up in the modern sections. Many historic buildings were badly damaged then and have since been restored as well. However, you don’t get the feeling that the Old City is a fossil, a carefully-preserved display for tourists, the way some old places (downtown St. Andrew’s-By-the-Sea, for instance — very pretty, but the locals all shop in the neighbouring town of St. Stephen) can become; it’s still very much a living neighbourhood, concerned with its own affairs. 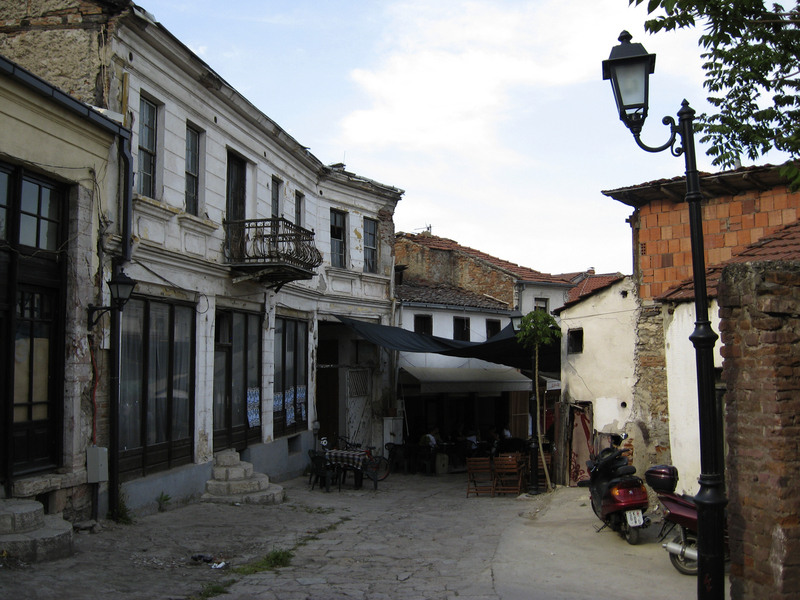 A street in the Old City, unusually empty of people, showing an old iron balcony. 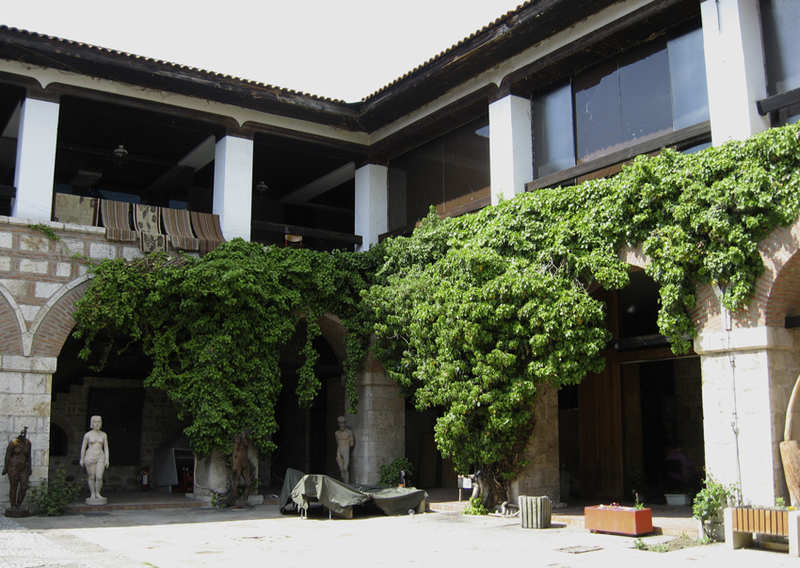 The danger in that, of course, is that as the republic becomes more prosperous, there will be a rush to modernize and many of the oldest everyday buildings, some of which are now in very poor repair or abandoned, will be torn down rather than restored and kept in use. An unusual view of a minaret. Dejan and Nikola were taking us to the Čifte Amam National Art Gallery, Чифте-амам, located in a hammam or Turkish bathhouse. Some of our party heading into Čifte Amam. My Bradt guidebook says it is early sixteenth century, commissioned by Isa Bey, but Wikipedia and other online sources date it to the mid fifteenth century. The mid fifteenth-century date makes more sense, since Isa Bey is İshakoğlu İsa Bey or Isa-Beg Isaković, who governed the Sanjak of Üsküb/Skopje from 1454-1463, right after the fall of Constantinople in 1453. This is one of two hammams in the Old City that are now art galleries. Before we went in, though, Aleksandar beckoned me aside and we went off for a private excursion. He wanted me to see the Suli An. Kuršumli An when I visited it in 2010. Seeing the reality of something I had only researched was a thrill; it confirmed some details I had made up because they seemed logical. 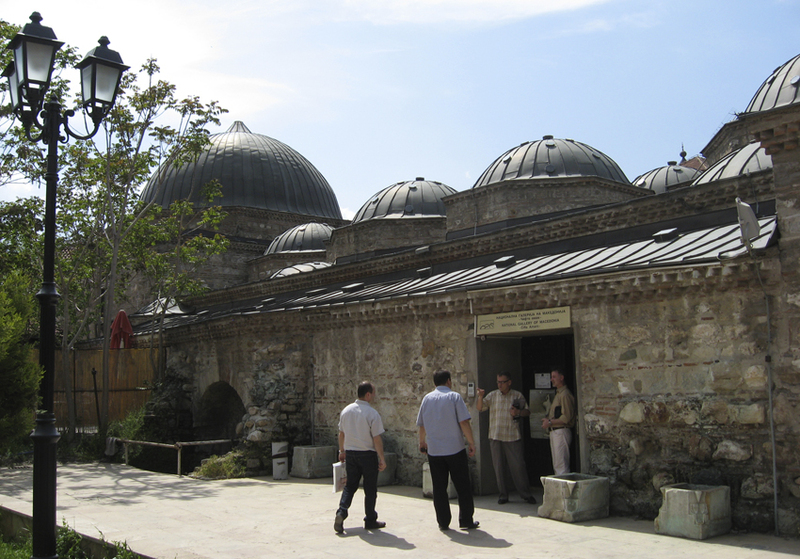 I had written about it on my website at the time and now Aleksandar wanted to make sure I had a chance to see another of Skopje’s caravanserais. The Suli An in 2013. After that, he took me to an antique shop in the Old Bazaar, full of all sorts of interesting oddments. Later, on a second visit, I would buy an old brass coffee mill there, which we find grinds much more nicely than our electric one. Back at the hammam, we rejoined the others. A roving gang of publishers, writers, and academics hanging out in the Čifte Amam. 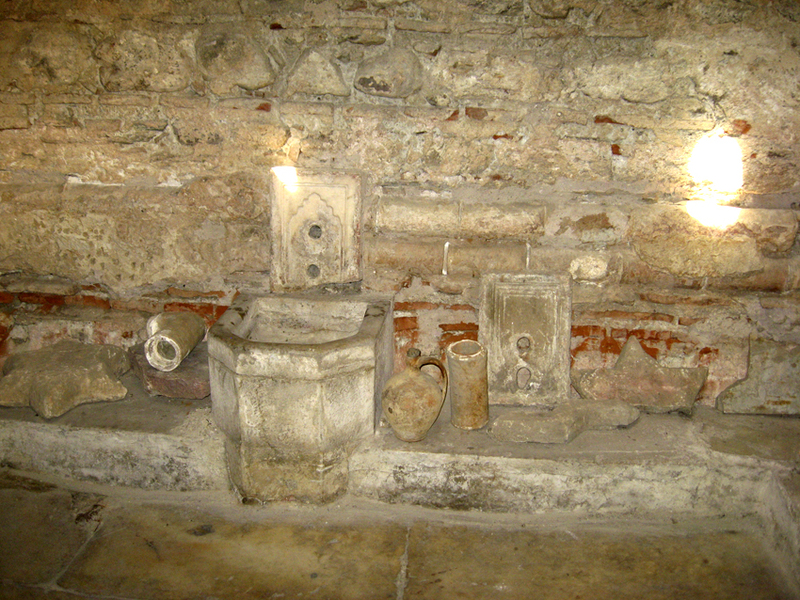 There were a couple of interesting exhibitions in the galleries, but what interested me most was when Aleksandar showed me into a room that had been restored more to what it would have been, with some original artefacts, the fountains that were along the walls, sections of clay water-pipe and the like, rather than turned into gallery space. One of the fountains in the Čifte Amam. One thing that struck me (luckily not literally, though it’s a hazard for us tall people), is how very low and narrow many of the original doorways are. 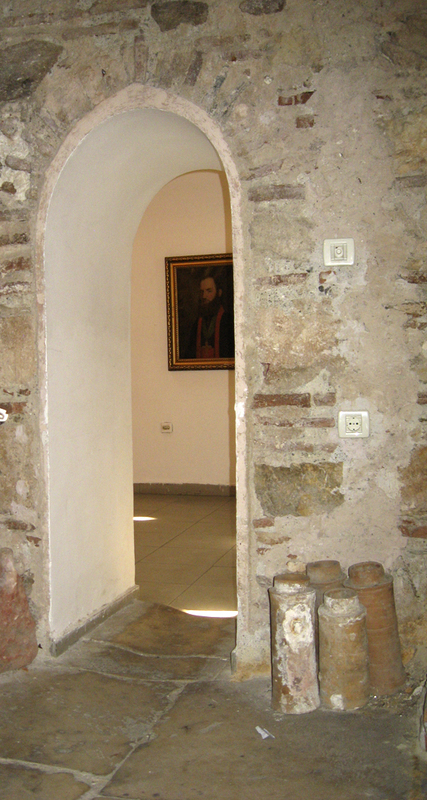 A doorway between rooms in the Čifte Amam National Art Gallery. Note the art! The quality of the sound under the large domes changes quite dramatically depending on your position. It’s details like that that you don’t pick up from reading. The truants, Dr. Aleksandar Prokopiev and I, reach the bathhouse at last. 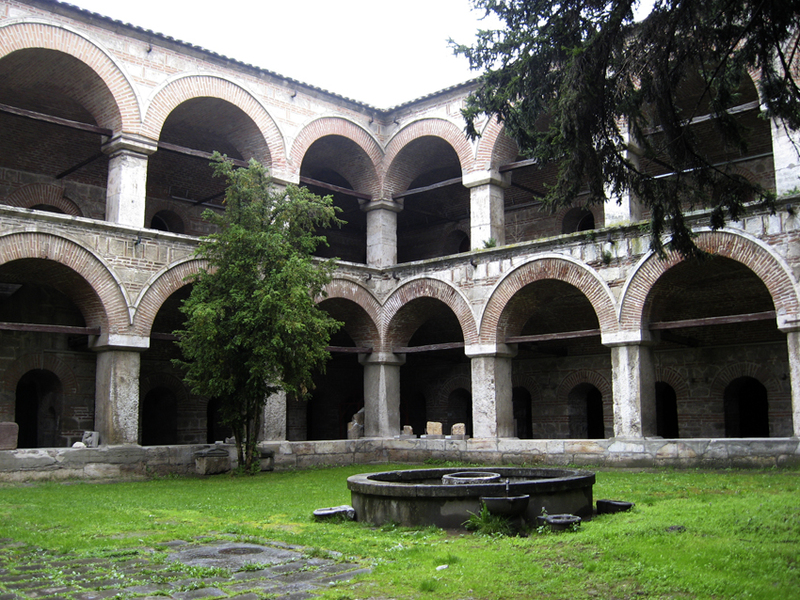 Our next visit was to the nearby Monastery of Sveti Spas. 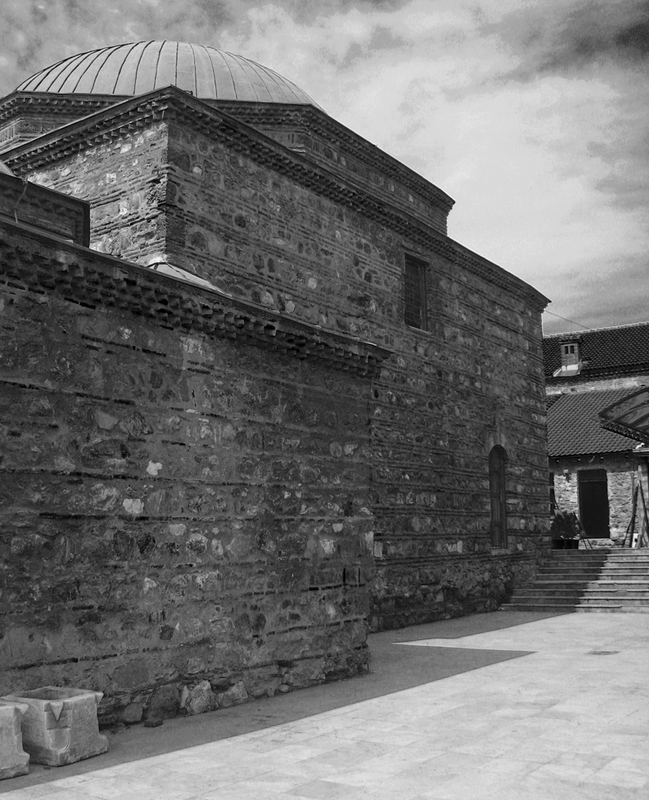 The site has had a monastery on it since before the Ottoman conquest, but the church within the courtyard is built partially underground, like a Grubenhaus, because during the Ottoman era a Christian church was not allowed to be higher than a mosque; they excavated and built down, to allow for the height of a bell-tower. The current church is said to date from the 16th century, although it was apparently renovated extensively during the 19th and 20th centuries. There’s a very beautiful carved wooden iconostasis (which separates the nave from the sanctuary) made in the early nineteenth century. No photography is allowed in churches, so you’ll just have to imagine what it’s like, in the low light: an entire wall of small, densely-packed figures in high relief, worked in some polished dark wood (walnut, maybe? ), depicting scenes from the Bible and from eastern hagiography, with coiling vines, flowers, and trees binding it all together. Further posts are to come, talking about Macedonian food and Matka! This entry was posted in Dispatches from the second Macedonian expedition, Photos and tagged Air Canada, Blackdog, caravanserai, flight delays, Macedonian children's books, Macedonian language books, Old City, Skopje. Bookmark the permalink.